Hwycruiser wrote: Although I have not mounted a Yakima cargo box yet I do not think it will stick out the front. I had a Yakima cargo box that did not allow for a 24" spread so I sold it and have not replaced it yet. But I did put the box I had on the roof and the fit appeared to be right on if I could have been able to use the 24" spread. The old style Yakima boxes are the same except the way the clamps on the underside work. You can see by the picture I added above using the rails with the openings puts the load behind the front passengers and it does not stick out beyond the front windshield as has been assumed. I think Ford designed the TX rails the way they did to force owners to properly load the vehicle between the wheels. I have 3 bikes on the roof in the picture each weighing approx 30lbs plus the weight of the rack. So I was probably at the weight limit of 125lbs and I could not even tell I had the bikes on the car. No handling difference or wind noise traveling at 70mph on the freeway. I think Ford designed the rails to look nice and add a new attractive low profile roof line. With the rail going straight, it becomes raised on the front where the roof drops. If they wanted people to only put clamps on the first 24", they would have stopped the rail there instead of putting the groove down the whole length. And most Ford cars use the groove for mounting, by the way, so they would have left that out if they didn't want people to use it. By your logic that Ford only wants people to use the raised rails, Ford doesn't want anyone to use the roof rails on my Sable Wagon that has rails flush the whole length of the car, and provide cross bars that fit into this groove. Mounting the box on the front part of the rails will definitely stick the box out into the jet stream, which flows back along the windshield line or further back. The car will handle better with more better with more equal weight between front and back. With the engine providing weight in the front, adding more load in the back will be better. Your speculation doesn't make sense. Incidentally, I commonly put 6 bikes on my Taruus X: 2 bikes on top and 4 on the rear hitch. Last year, I also took a ride from California to Moab, Utah, and Fruita, Coloroado with four mountain biker friends - four bikes on back and lots of camping gear on the roof box. The Taurus X is a travel vehicle of choice among among my biking friends. Hwycruiser wrote: Mounting the box on the front part of the rails will definitely stick the box out into the jet stream, which flows back along the windshield line or further back. Will have to agree to disagree on this one. The load is behind the front passengers over the middle row which distributes the weight well equal front to back. Although I have not mounted the new Yakima Skybox yet, from my calculations I do not expect it to stick out front. The Yakima mounts are adjustable to properly mount the box while still being able to carry the load. As far as the rails they probably should have put a plastic filler in the rails but probably left it off as a cost saving. I wonder what happens in fridgid climates when the rail fills up with water (do not see any drain holes) and with ice freezing in them it does not seem like a good idea for the rack to last. I do agree that the TX is a great vehicle. Sorry for the late reply. Yes, I pulled up this forum at the rackshop and they read through it. They did install my Landing Pads with the spacer block in there like your photos showed. We shook the rack like crazy, seemed stable. to make it work, they are a 6 mil screw - I got 1.5 inches long, with a hex head. You mount the base plate using the screws onto the factory rack (they come with a washer which they thread into), the towers then snap unto the plates. I recommend getting a faring, as due to the height of the towers a lot of wind noise is produced. The faring reduces this a lot. Thule actually lists a rack that is supposed to work on the Taurus, but the listing is not correct, that rack would only work on the front part of the Taurus X roof rack. I've just bought a Yak Pro 16s and low rider mounts for my X. For now I'm using the 27" raised section but I have a half set of the new Rail Grab mounts on the way to try to take advantage of the flush mounted rear portion of the rack. Figured I'd be a Rail Grab guinea pig to see if they work straight out of the box or not. I'd like to mount it just a little bit further back just for peace of mind/balanced look but honestly it rides very well so far even on just the short raised section. I'll take pics of the current config and then the Rail Grab config if it works. I thought with it being forward (as it curently sits) it would be more noticeable behind the wheel but you really don't even know it's up there as far as resistance or noise wise. I could hear the wind with the sunroof shade open but that was about it; slid it closed and forgot it was even up there. I've got rail grabs coming to me for this weekend so I will get to post up results pretty soon. Regarding the RailGrab towers and 2008 Taurus X. It doesn't seem to fix the problem with not being able to mount in the area where the rails are flush. The RailGrab has a clip on the inside of the tower with a knob to tighten the clamp in the proper horizontal position against the bottom of the rail. However, since the Taurus X rail is a "U" shape, the knob prevents the tower from resting properly on the rail. Argggghhhhhh!!!! I was hoping that the long claw may have enough of a drop for the tightening knob on the inside to fall above the inside portion of the rail. I definitely think the short claw is out the window. They are supposed to arrive tomorrow so I guess I'll monkey around a little bit and see if they can be tinkered with. Well I fiddled around with the RailGrab towers last night and they aren't going to cut it either without modding the siderails which would be ludicrous or coming up with a custom claw attachment. Looks like the Landing Pad mod is probably the route I'll go too since the path has already been blazed. tabraha wrote: Well I fiddled around with the RailGrab towers last night and they aren't going to cut it either without modding the siderails which would be ludicrous or coming up with a custom claw attachment. Looks like the Landing Pad mod is probably the route I'll go too since the path has already been blazed. 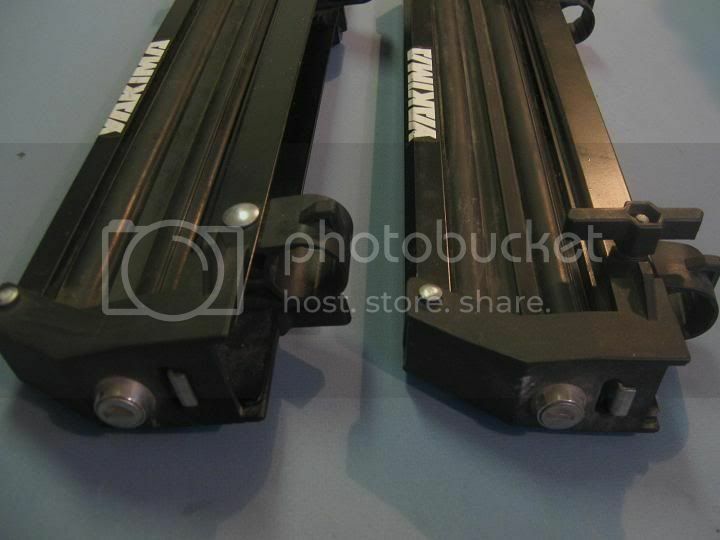 When I first looked at those RailGrabbers I suspected they'd only work on the raised portion, just like the "offiical" version from Ford, which is just a resold Thule rail. My Landing Pad modification, detailed at the beginning of this thread, is still working great at 1.5 years now, I've got thousands of miles of cargo box and bike time on the roof rack. When I'm not carrying anything on the top, I remove the cross bars by the simple clips on the pads. I then put short covers over the landing pads. It lowers wind resistance and looks nicer. So has Ford come out with OEM Crossbars yet for the Freestyles? Taurus X with Yakima Landing Pad 5 and 48 inch cross bars, very solid. Last edited by lattjiu on Fri May 27, 2011 3:23 pm, edited 1 time in total. Lots of useful info in this thread! Thanks so much for posting the pictures, guys!!! Just scored these off eBay. Going to be a fun project. Just got the mounts in the mail. Look just like the pics. Now to find some 48" cross bars.